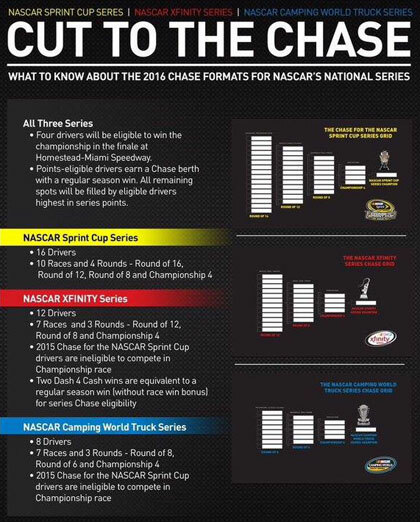 NASCAR is expanding its Chase format to include its feeder series, meaning the champions from the Xfinity and Truck Series will now be crowned in a four-driver shootout at the season finale. The format announced last week by NASCAR Chairman and CEO Brian France mostly mirrors the playoff-style setup used to determine the Sprint Cup champion the last two years. That system has 16 drivers race through three rounds of eliminations to establish a field of four in which the highest finisher in the finale wins the championship. The Xfinity and Camping World Truck Series will use a seven-race Chase to decide their champions. The Cup series uses a 10-race format.